With simple arguments, researchers show that nature is complicated! Researchers from the Niels Bohr Institute have made a simple experiment that demonstrates that nature violates common sense – the world is different than most people believe. The experiment illustrates that light does not behave according to the principles of classical physics, but that light has quantum mechanical properties. The new method could be used to study whether other systems behave quantum mechanically. The results have been published in the scientific journal, Physical Review Letters. In physics there are two categories: classical physics and quantum physics. In classical physics, objects, e.g. a car or a ball, have a position and a velocity. This is how we classically look at our everyday world. In the quantum world objects can also have a position and a velocity, but not at the same time. At the atomic level, quantum mechanics says that nature behaves quite differently than you might think. It is not just that we do not know the position and the velocity, rather, these two things simply do not exist simultaneously. But how do we know that they do not exist simultaneously? And where is the border of these two worlds? Researchers have found a new way to answer these questions. “Our goal is to use quantum mechanics in a new way. It is therefore important for us to know that a ‘system’ really behaves in a way that has no classical explanation. To this end, we first examined light,” explains Eran Kot, PhD-student in the research group, Quantum Optics at the Niels Bohr Institute at the University of Copenhagen. 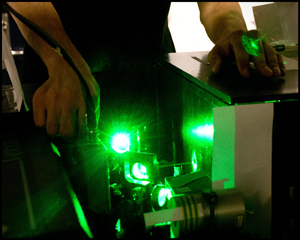 Based on a series of experiments in the quantum optics laboratories, they examined the state of light. In classical physics, light possesses both an electric and a magnetic field. “What our study demonstrated was that light can have both an electric and a magnetic field, but not at the same time. We thus provide a simple proof that an experiment breaks the classical principles. That is to say, we showed light possesses quantum properties, and we can expand this to other systems as well” says Eran Kot. The aim of the research is both to fundamentally understand the world, but there is also a practical challenge in being able to exploit quantum mechanics in larger contexts. For light it is no great surprise that it behaves quantum mechanically, but the methods that have been developed can also be used to study other systems. “We are endeavouring to develop future quantum computers and we therefore need to understand the borders for when something behaves quantum mechanically and when it is classical mechanics,” says professor of quantum physics Anders S. Sørensen, explaining that quantum computing must necessarily be comprised of systems with non-classical properties.